Question: Two mirrors are placed at right-angles to one another. Show that a light-ray incident from any direction in the plane perpendicular to both mirrors is reflected through . Hence, , for all values of . 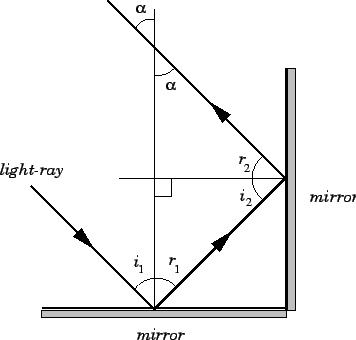 It can easily be appreciated that a combination of three mutually perpendicular mirrors would reflect a light-ray incident from any direction through . Such a combination of mirrors is called a corner-cube reflector. Astronauts on the Apollo 11 mission (1969) left a panel of corner-cube reflectors on the surface of the Moon. These reflectors have been used ever since to measure the Earth-Moon distance via laser range finding (basically, a laser beam is fired from the Earth, reflects off the corner-cube reflectors on the Moon, and then returns to the Earth. The time of travel of the beam can easily be converted into the Earth-Moon distance). The Earth-Moon distance can be measured to within an accuracy of using this method.